Stuart graduated in Physiology and Sports Science from the University of Glasgow before undertaking a PhD entitled "Temperature and in vivo human skeletal muscle function and metabolism" at the University of Strathclyde(2007). During his doctoral studies Stuart was awarded the Pfizer Prize from the Physiological Society in 2005. Stuart remained at the University of Strathclyde as a Post-Doctoral Research Fellow before moving to Loughborough University to take up a Senior Research-Associate position. 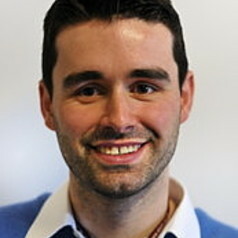 Stuart joined the institute of medical sciences in November 2008 as a Lecturer in Exercise Physiology. Stuart has two main areas of interest. With age there is a natural loss of muscle mass that is termed sarcopenia and this can have major effects on physical function and quality of life in the elderly. The precise cause of the loss of muscle mass is not yet known, but we do know that elderly muscles exhibit an anabolic resistance to exercise and food intake. We are currently investigating whether an increase in n3 PUFA consumption, particularly fish oils, can augment the adaptive response to resistance exercise in the elderly. Preliminary results have shown that fish oils can retard the loss of muscle mass with age in a rat model and that this effect is potentially mediated through an increase activity of p70s6k, a key regulator of protein synthesis. We are also interested in determining the effects of high intensity exercise on post prandial lipaemia and activation of the immune system. Upon the consumption of a high fat meal triglycerides enter the blood stream and can trigger a series of inflammatory reactions that ultimately results in endothelial dysfunction, a precursor for the development of atherosclerosis. It is known that exercise can reduce the magnitude of this response but the optimal and most time efficient form of exercise has yet to be determined. We are also interested in extending this research to patient populations where post prandial lipaemia is a contributing factor to disease progression.